Read on to learn all about barley, including a definition, how to cook barley, plus try some healthy barley recipes. Whole grain barley is a healthy high-fiber, high-protein whole grain boasting numerous health benefits. 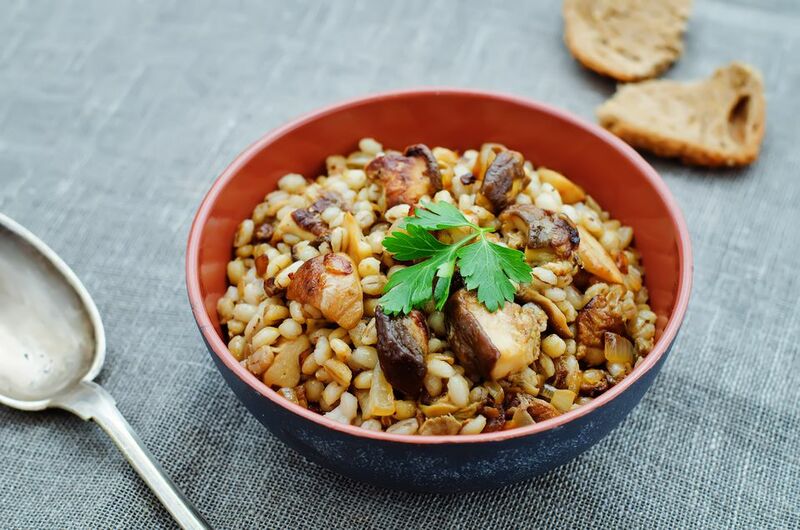 When it is cooked, barley has a chewy texture and nutty flavor, a bit similar to brown rice. Although making a barley soup is probably the most popular and familiar way to eat barley, you can use it just like you would use any other grain such as couscous, quinoa or rice. Serve a vegetarian curry or vegetable stir-fry over barley instead of rice or make a barley pilaf or a barley salad (just you would make a quinoa salad or a rice pilaf), or, just add a handful to your favorite soup or salad. Barley is available in natural food stores in the bulk bins or the baking section or in the regular aisles near the rice and other grains. Some regular grocers stock barley in the natural foods aisle or next to the beans and lentils. Dehulled barley, or hulless barley, sometimes also called unhulled barley, is unprocessed and takes longer to cook than pearl or pearled barley, which is more common and what most grocers sell. Quick cooking barley (sometimes called "instant barley" is just as healthy, yet takes only 10 minutes to cook. Try adding a handful of quick cooking barley to a simmering pot of soup. Most grocery stores will usually only sell pearl or pearled barley. Finding other varieties can be a bit of a challenge, but most recipes also call for pearled barley. Note that all of the barley recipes on this site will use pearled barley, as it is most common. If you're using quick-cooking or instant barley, you'll need to adjust the recommended cooking times accordingly. Cooking barley is similar to cooking rice. Cover 1 cup of pearl barley with 2 cups of water or vegetable broth and simmer for 30-40 minutes before fluffing with a fork. Or, try using a rice cooker. Add 2 1/2 cups water per cup of barley. Pre-soak barley in plenty of water to cut down on the overall cooking time. Barley can be pre-soaked for as little as just an hour or up to overnight. Pre-soaking your barley will reduce the cooking time to about fifteen minutes. Barley can also be cooked in a pressure cooker, though you'll want to follow the individual instructions on your own pressure cooker, since cook times can vary a bit between models. Just how healthy is barley? According to the FDA, barley's soluble fiber reduces the risk of coronary heart disease and can lower cholesterol. But that's not all that this amazing food does! Barley also contains insoluble fiber, which reduces the risk of Type 2 diabetes and colon cancer. One cup of cooked barley provides 193 calories, 6 grams of fiber and 3.5 grams of protein. With less than one gram of total fat per serving, barley is a virtually fat-free food and is also completely cholesterol-free. Did you know....98% of barley grown in the United States will never make it into your soup! Barley is refined to make barley malt - a key ingredient in beer and is also grown for feeding animals used for food.